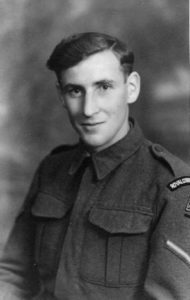 When I registered for military service at the age of 17½ in 1939 I was told I could not be called up for military service because I was in a reserved occupation. My trade was pattern making. I was also told this in December 1942 when I went to the army recruiting office to volunteer. I went in again in the spring of 1943, and I was accepted, but not in my trade. On being asked for a second choice, I said Royal Corps of Signals. I eventually received my papers and a travel warrant to go to a signals depot at Prestatyn in North Wales in June 1943. I travelled as instructed in Home Guard uniform from Wolverhampton to Prestatyn. On arrival we marched to the camp. I spent one night there, for the next day we left Prestatyn and travelled via Wolverhampton to Warwick. As we came through Wolverhampton I saw my home, the place I’d left the day before. I did my six weeks’ infantry training at the Primary Training Centre at Budbrooke barracks and on completion I went to Catterick to start training as an Operator Keyboard and Line (OK/L). On completion of my training I had a week’s leave at Christmas 1943, and was posted to 18th Air Formation Signals, which was being formed at Huddersfield. I joined the football team and enjoyed playing in and around Huddersfield. I was then sent on detachment for experience training on operational duties at Broughton Hall near Preston at HQ RAF 9 Group, which was an Aircrew Training Command with Training Airfields scattered around the Midlands, North Wales and Lancashire. I asked about sport and was told to see Flt/Sgt Tommy Jones. As a result I got a few games for RAF 9 Group. After one match I was approached and asked if I would like a trial for Preston North End. I was posted from there to RAF Bentley Priory, near Stanmore in Middlesex, which was HQ Air Defence of Great Britain (ADGB) and HQ Allied Expeditionary Air Force (AEAF). This is where I first worked alongside American personnel in the teleprinter centre. I was on duty on the night of 5/6 June in the underground headquarters. During the night an RAF officer had come on duty and his Alsatian dog had followed him. I was detailed to come up from underground and report to the guardroom, collect the dog and take him home. This was at 0500 and it was then I saw the greatest sight imaginable: the sky was a mass of planes flying south. D-Day had started. Shortly afterwards I was returned to unit (RTU) at Hendon along with all my soldier colleagues who had been on airfields all over the south of England operating teleprinters – Biggin Hill, Kenley, Manston, Tangmere, Hurn, etc. 18th Air Formation Signals then moved south to Salisbury Plain and in August moved down to the Portsmouth area. We embarked in mid-August in a Landing Ship Tanks (LST). It was 1100 when I got on board; we had been up all night in pouring rain. Loading completed, we moved out to Spithead, from where we set sail at 2300 in convoy. We arrived off the Normandy coast at 0500 next morning. At 1000 I went up on deck and we had moved inshore. The ship was rocking about and I was sick so I went below and fell fast asleep. At 1500 the shout went up ‘Everybody Off’. I clambered down the spiral staircase, went into the vehicle deck area and made my way to the now open bow doors and ramp. We were high and dry on JUNO beach. As I went up the beach 300 wounded were carried or helped down from a line of ambulances and onto the LST. We stayed in the British zone for two days, then in convoy we moved south via Bayeux, Vire, Domfront and Mayenne to Laval, well in the American zone. After a short stay we set off in convoy again and arrived in a village called Le Chesnay on the outskirts of Versailles, a day or two after Paris was liberated. Our signals centre vans for teleprinters and switchboard were set up in the grounds of the Trianon Palace Hotel, General Eisenhower’s HQ and living quarters. In two Queen Mary type vans, back to back, we had 22 teleprinters, 11 in each van, and one American Teletype machine, always operated by a yank. Our unit played football every Sunday in the Paris area. In February 1945 some of our unit went to Reims SHAEF Forward. I stayed in Versailles until VE-Day when we packed up and set off for Germany via Metz, our first overnight stop, then on to Frankfurt via Saarbrucken and Kaiserslautern, where our second overnight stop was in the I G Farben buildings. We then left for the British zone via Koblenz, Koln and Paderborn, and set up an RAF Signals Centre at Detmold airfield. One detachment of 18th Air Formation Signals went from Frankfurt to Berchtesgaden, Hitler’s hideout in Bavaria. From Detmold the younger men were ordered back to England via Osnabruck, Ostend and Dover, then by train to Bury in Lancashire. We paraded in the Manchester VJ-Day parade. I learned after the war that Flt/Sgt Tommy Jones with whom I played football at RAF 9 Group was the Everton centre half.